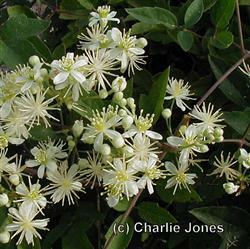 This clematis is an easy to grow rambling vine with small cream flowers and delicate leaves. Grow in full or part shade and provide a somewhat moist environment. Allow this clematis ot crawl along the ground in fthe front of a border or at the base of a wall or fence. Other uses can include allowing it to drape over a retaining wall, or climb up and through trees and shrubs.